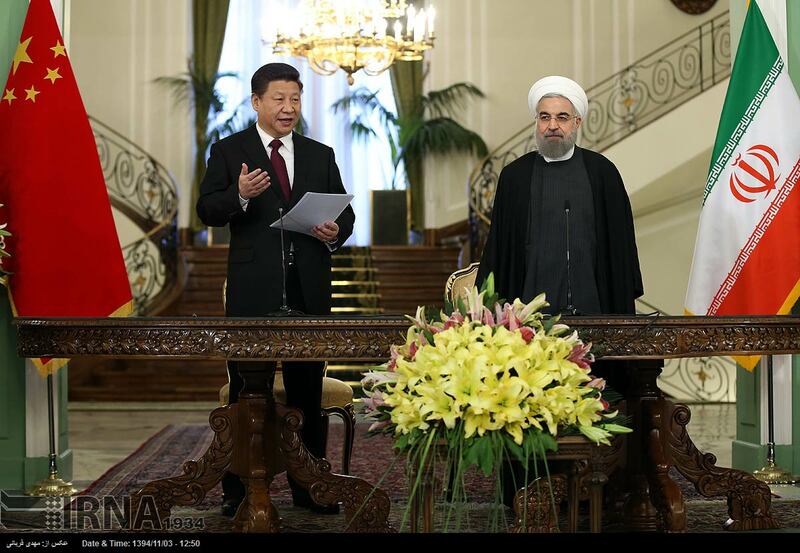 Chinese president Xi Jinping (L) and Iranian President Hassan Rohani in Tehran on January 23. Rohani made the announcement following January 23 talks in Tehran with Chinese President Xi Jinping, the first major world leader to visit the Islamic republic since the easing of international sanctions on January 16 under a deal between Tehran and global powers aimed at curbing Iran's nuclear program. Xi met later with Iranian Supreme Leader Ayatollah Ali Khamenei, who was quoted as saying that "Tehran seeks cooperation with more independent countries" because "Iranians never trusted the West." At a news conference with Xi broadcast live on state television, Rohani said that "Iran and China have agreed to increase trade to $600 billion in the next 10 years." He added that the two countries "have agreed on forming strategic relations [as] reflected in a 25-year comprehensive document." Khamenei praised the agreements and lambasted the United States in comments on Twitter. "Agreement on '25-year strategic ties' between #Iran and #China is correct and wise, must become effective with follow-up of both sides," one tweet said. "Among western countries, U.S. policies toward Iran are worse & more hostile; it makes Iran pursue development of ties with independent states," said another. Iran and China signed 17 accords on January 23, including on nuclear cooperation and reviving the ancient Silk Road trade route, known in China as One Belt, One Road. China is the top buyer of Iranian oil. Trade between the countries was valued at $52 billion in 2014, but fell slightly last year due to declining global energy prices. Xi is the second major world leader to visit Iran since Tehran signed the nuclear deal with world powers in July. Russian President Vladimir Putin visited the Islamic republic in November. Xi also became the first Chinese leader to visit Iran in 14 years. He visited Saudi Arabia and Egypt prior to arriving in Tehran. 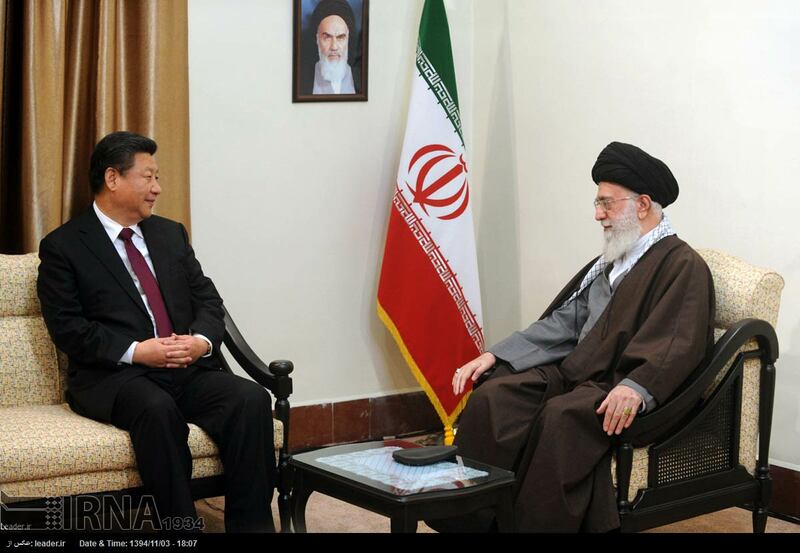 Following his meeting with Rohani, Xi met with Iranian Supreme Leader Ayatollah Ali Khamenei. Chinese President Xi Jinping meets Iran's Supreme Leader Ayatollah Khamenei in in Tehran, Iran, Jan. 23, 2016. Iranian state TV quoted Xi as saying: "In cooperation with the Iranian side and by benefiting from the current favorable conditions, China is ready to upgrade the level of bilateral relations and cooperation so that a new chapter will start in bilateral relations." In comments posted on his official website, Rohani said that China "has always stood by the side of the Iranian nation during hard days." 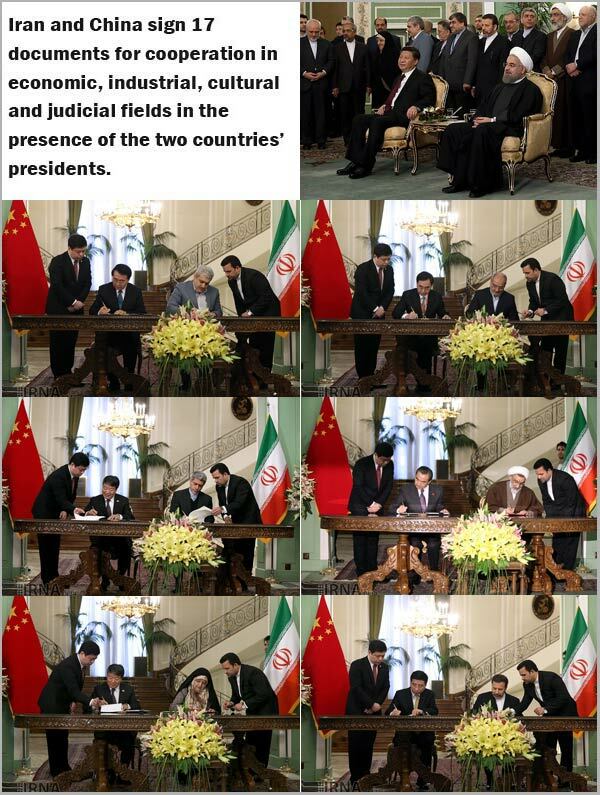 China is among the world powers -- along with the U.S., Germany, France, Britain, and Russia -- that signed a landmark deal with Iran in July in Vienna to lift international sanctions in exchange for restrictions on Tehran's nuclear program. The deal was implemented last week after the UN's nuclear watchdog confirmed that Tehran had fulfilled its commitments under the agreement. U.S. and other sanctions that were not imposed due to Iran's nuclear actvities remain in place, and Khamenei has stressed that the deal does not mean ties with the United States will improve.